Seller likes his projects. He built it, enjoyed it, used it some, & now wants to go to next project. "Beautiful Excellent Condition 238 Open Fisherman! Restored in 2018 down to the wiring & new hard Top! 2007 Verado 250 hp with just 730 hrs!" Rebuilt Fabulous Fishing Machine! Per the seller, rebuilt with everything top of the line, both for performance and endurance! This boat was rebuilt from the hull up. New fittings, new and complete wiring harness, new switches, new power steering, new tanks, new pumps, batteries, charger, lines, hoses, everything, and it is beautiful! 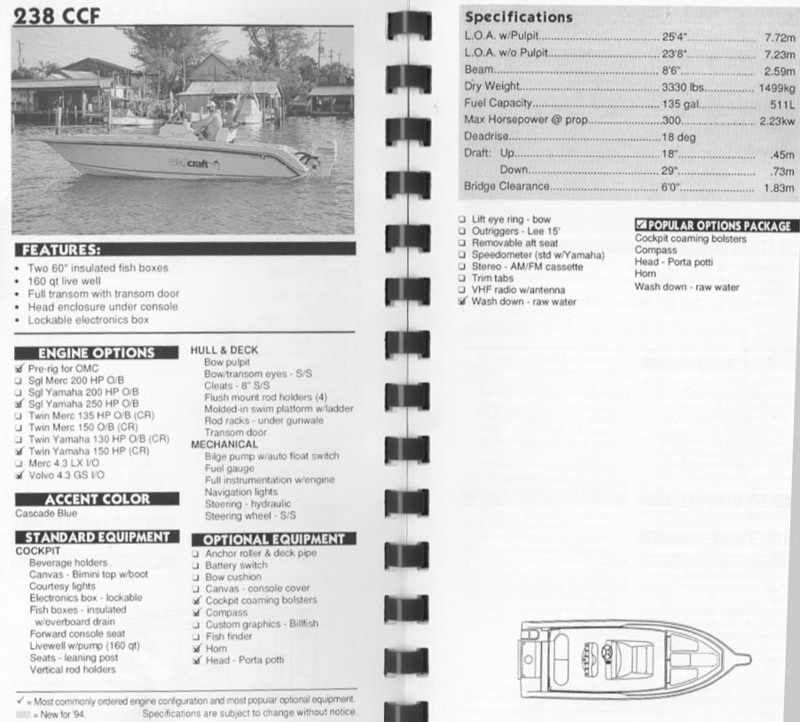 This is one of Wellcraft Marine's finest and versatile center console bay boats, the 238 CCF (Center Console Fisherman). This boat, with its anchor pulpit, has an overall length of 25 feet 4 inches, the beam is a very comfortable 8 1/2 feet wide, has a minimum draft of 1.5 feet, a 135 gallon fuel tank, will go from shallow water to blue water and get you to all kinds of fishing grounds! Just a great boat set up for fishing, comfortably with cushioned coaming, great seating, and seat cushions, live well, insulated fish boxes with drains, and so much more. You will love the detail to finish and functionality that this boat has! This boat is clean! Per the seller, it has as been rebuilt with top of the line wiring, equipment, brightwork, rigging, batteries, and so much more. All the pumps have been replaced, and the 2007 Mercury Verado has been a great engine for Seller who took it off another boat that he owned. This engine now has 730 hours clocked on it and according to the seller has always been dealer serviced with all scheduled maintenance done and completed as recommended by the dealer. In order to see all 197 photos and more, please quickly create an account. It just takes a second and you will have unlimited access to view information for this listing and ALL others on the website. In order to see all 197 photos, download a brochure, and more, please quickly create an account. It just takes a second and you will have unlimited access to view information for this listing and ALL others on the website. In order to see all 197 photos, download a brochure, and more, please quickly create an account. It just takes a second and you will have unlimited access to view information for this listing and ALL others on the website. If you don't use social media, click here to register with your email.